I’ve had numerous requests to add N90 (Nichrome 90) to the materials in Steam Engine. Quite a few vapers use it for their coils, and most of them seem happy with the performance. So, in order to give the N90 users out there the opportunity to use my calculators to build their coils, I’ve been trying to figure out what N90 is. But that is easier said than done. I have not been able to find any proper data sheets on the material, or any real data for that matter. Trying to scrape data off the web hasn’t been straightforward either. 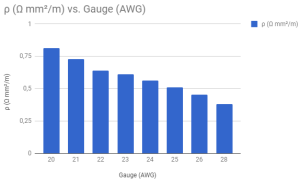 In order to make sense of this data I started out by converting the gauges to cross section areas in mm², and the resistance per inch to resistance per meter. Then I could calculate the resistivity of the material in Ω mm²/m. And this is where my head meets the wall. Resistivity is an intrinsic property of a material. That means that if all these wires are made from the same material, and the gauges are accurate, and the stated resistance per inch is accurate, and I haven’t made any mistakes in my calculations, then the resistivity of each gauge ought to be identical. This is the number that I would add to the Steam Engine database in order to enable using N90 for wire and coil calculations (along with the density, the heat capacity, and preferably the TCR). Of course we should allow for some rounding errors in this table, but if you study the rightmost column, it becomes clear that this simply does not add up. Here’s a graph to illustrate the magnitude of the discrepancies. All the bars should be more or less the same height. I could take the mean value of all these and add it to Steam Engine, but that would hardly be any better than guessing. Until I can get hold of some data that is more reliable/comprehensible, I’m sorry to say that it will be impossible for me to add N90 to Steam Engine in any meaningful way. I’m still scratching my head over what the mystery material N90 really is. I’ll round off this post with a comparison between the resistivity of a few common Nickel based wire materials. I got hold of a PDF which states a resistivity of 0.7 μΩ.m and a density of 8.7 g/cm3. Unfortunately no TCR or heat capacity was stated. I might be able to guesstimate some approximate values for those, but I’d rather have actual data. Hi. 316L is 316L regardless of whether it’s wire or mesh, the TCR is the same. Ni90 could be T1-thermocouple alloy, Ni90Cr10 also known as Chromel. Would it not be possible to get a few different samples of Ni90 (from different vendors or whatever) and as precisely as possible, using an identical piece from each sample source, read the resistance and then calculate the resistivity that could be used as a *reasonable* constant in your equations? Yeah, provided that the values are not all over the place, which they might be. That being said, any vape wire vendor is free to send me the numbers for the particular wire that they’re selling. I’ll gladly include it.